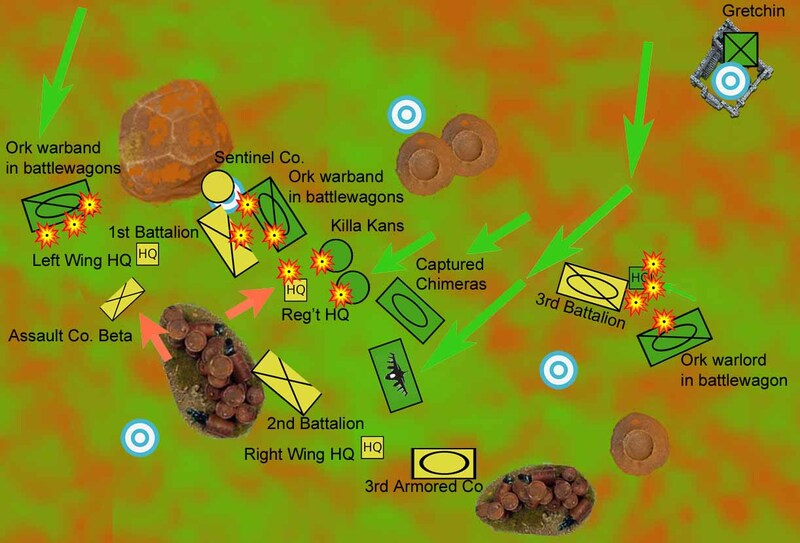 A second attempt by ork invaders to cross the infamous Sea of Dust was decisively defeated by Imperial troops, according to yesterday’s proclamation by Gen. Tiberius Vectrix, newly promoted supreme commander of Imperial military forces on Hegira. As the ork army came into firing range, it found Imperial forces deployed to maximize its firepower. 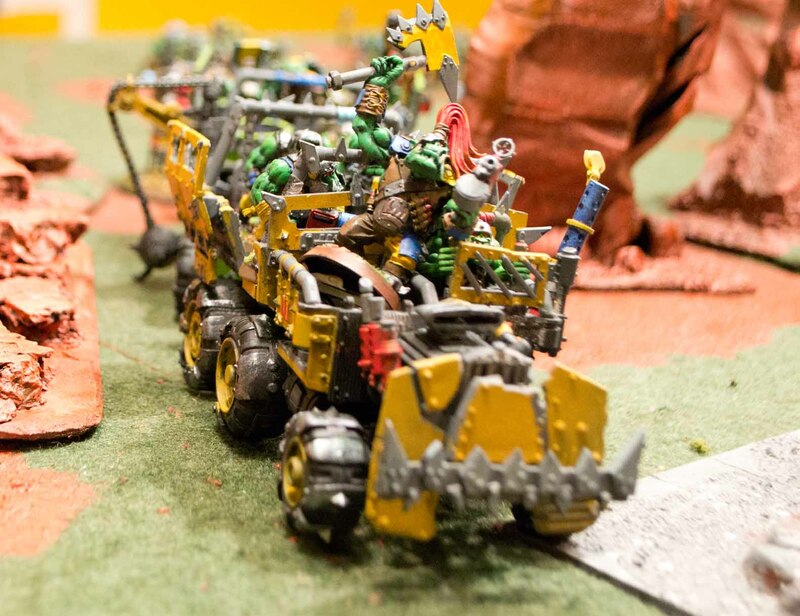 The second ork attack across the Sea of Dust began on 3 726 735.M41, when Imperial surveillance satellites spotted a five-mile-wide column of ork warbikes, battlewagons, and Killa Kans leaving the ork-occupied Herak Manufactorum and heading northeast toward the Imperial defense lines. The early warning system–built at the insistence of Gen. Tiberius Vectrix–provided Imperial forces with ample time to reinforce the defenses with additional armor from the 728th Cadian Regiment. Also deployed were specially organized assault companies, mounted in armor transports, designed to provide a potent counterattack force that could go “toe to toe” with the xenos in melee. 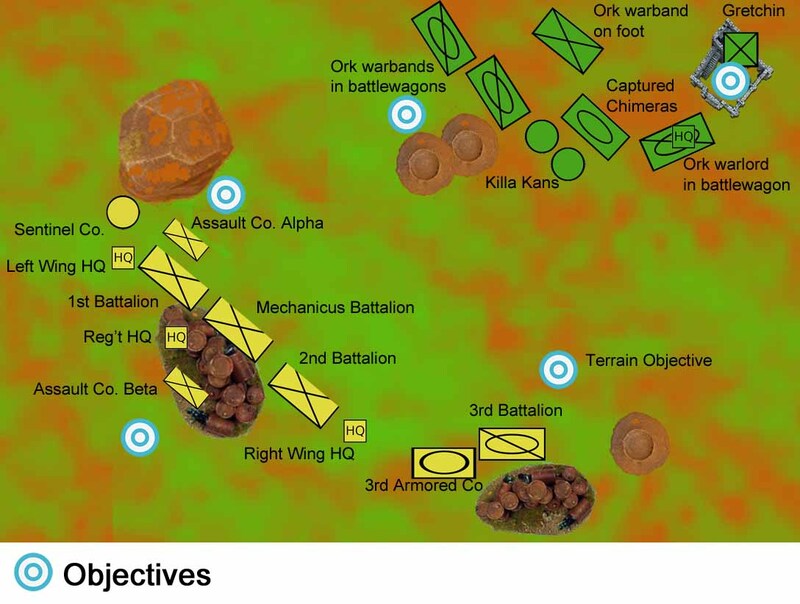 This force was put under the direct command of Col. August Klein, commander of the 728th, who opted on what he described as a “aggressive” defense that relied on well-timed counterattacks to break up the ork attack and deny the enemy the initiative in battle. 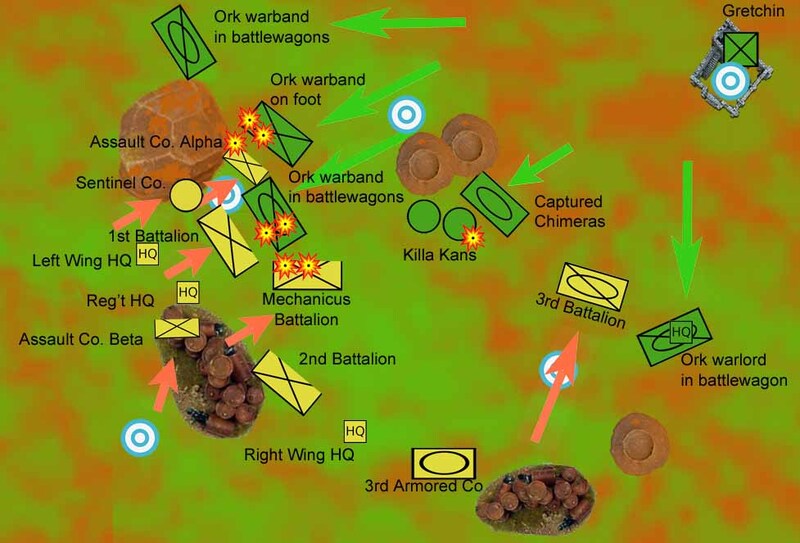 Actual military action began on 3 730 735.M41 when the ork column approached within 5 kilometers of the Imperial line, and the ork assault spread out widely as the battle-hungry orks rushed forward to close with the ‘humies’. MAP ONE: The early hours of the battle saw the ork forces advance on the Imperial line, only to be met with highly focused counterattacks designed to cause massive xeno casualties. As the orks came within firing range, the Imperial forces opened up with all weapons, resulting in fierce casualties. Still, the now-unorganized line of xenos rapidly approached, many orks still untouched by Imperial fire as they were protected within the rickety armor of their battlewagons. Imperial forces responded in an uncharacteristic manner. Rather than sit back on the defense, as in past battles, the left flank moved forward, with two assault companies advancing to smother the ork infantry with their flamethrowers and strike at the ork vehicles with krak grenades. 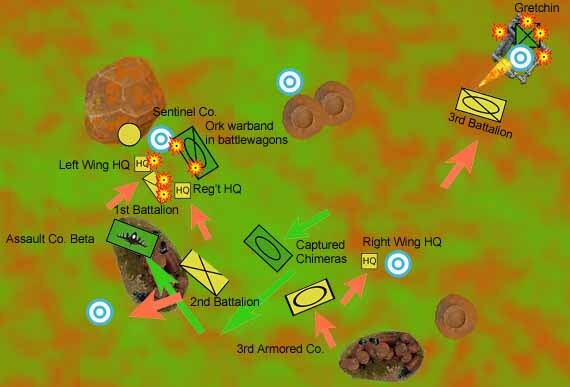 Meanwhile, in the center, an assault company on Chimeras advanced through the open ork center, targeting a Gretchin-held supply depot to the ork rear–and baiting the ork warlord into counterattacking and abandoning his original and no-doubt-insidious attack plan. MAP TWO: Orks turn the Imperial left flank, but reserves quickly respond. On the right flank, the ork warlord is drawn into a counterattack against the mobile 3rd Battalion. Little did the ork warlord realize–nor would he have cared–that this was exactly what Imperial officers expected. Meanwhile, for the first time, ork fighter aircraft provided support to ground forces. MAP THREE: With few troops left on the battlefield, the Imperial Guard holds the line. New threats soon appeared to assail the Imperial Guard. An ork fighta’ squadron–the first seen to support a ground attack during the war–appeared from behind the ork line and strafed the Imperial lines. As troops scrambled for cover, xeno-captured Chimeras–armed with an assortment of crude flamethrowers–rushed forward to drench Imperial troops with flaming prometheum. Imperial casualties were high, and the line buckled as men fled in terror. By late afternoon, both sides were battled, but ork casualties were horrendous. With the ork warlord dead, the ork left flank collapsed, and the assault companies advanced on the Gretchins and seized the supply depot. (Breakthrough for the Imperium.) Although the ork fightas strafed the Imperial Guard repeatedly, the troops rallied and eventually wiped out the vehicle-mounted flamethrowers. Victory Points: Humans: 3 terrain objectives held, Slay the Warlord warlord, Breakthrough = 6 v.p. Orks: 1 terrain objective held, First Blood = 2 v.p. TheGM: Whew! There is one thing I’ve learned about fighting The Gaffer. Stay unpredictable. I have the advantage in that I’ve painted up a lot more troops than he has. This battle was our first at nearly 1,000 points each, so he put everything he owned on the table–and his tactics were limited by those units. With more troops, I could swap out units to fit whatever strategy I chose. And I deliberately switched gears this battle. When I retook the Iron Spires a while back, I used an all-infantry force and fought a battle of multiple defensive lines and attrition. This time, I took more armor, and I bolstered my force with more melee-oriented troops that allowed me to seek out melee aggressively from the beginning. All in all, it went well. That’s not to say there was any inevitability in my victory–a few bad die rolls and my line would have rolled up. But I take some satisfaction in having had a plan–and in the fact that it worked pretty much as I wanted, despite the horror of learning what a vehicle with multiple heavy flamethrowers can do to an infantry line. TheGaffer: Well…<ahem>…I’ll just have to call this a learning experience. The terrain was very, very open which is definitely not ideal ork country and made it a tough challenge. With a relatively few infantry, I had to concentrate my forces limiting my options. The GM’s fire by volleys tore up the three ground mobs so the Orks just did not have enough infantry to keep up any kind of attack late in the game. The brand new dakka jets did not give a good showing in their first deployment. The angle of attack began too far in the center of the board so it did not get as many shots on units as it could have. We also learned that a third supa-shoota on the jet is needed to make it worthwhile. It chewed up some infantry, but not enough to make a difference. All that being said, I was pleased that I managed to get three victory points. After two tries to cross the sea of dust. I’ll have to try to find another avenue of advance into the north of Hegira. Hats off to TheGM for a fine and decisive victory.